Hockey Blog In Canada: It's Back! Clear your schedules, folks. Or, if you're Tom Wilson of the Washington Capitals, just relax at home. Hockey is finally back, and we're not talking meaningless preseason hockey that accomplishes nothing. We're talking regular season hockey with two points on the line, division leads to be determined, and an Original Six match-up of the two most storied franchises in Canadian hockey history. 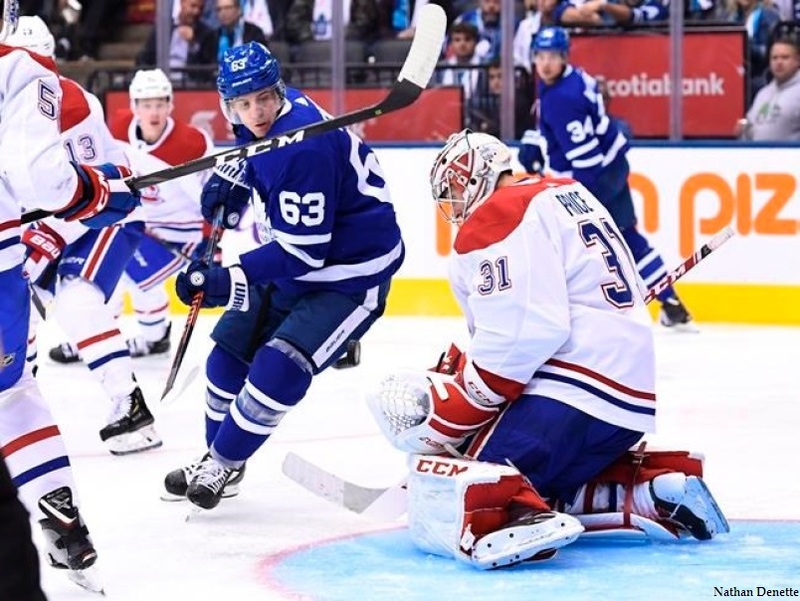 The Toronto Maple Leafs and Montreal Canadiens meet tonight to kick off the 2018-19 season, and I'm looking forward to another season of great action and incredible highlights! The scent of ammonia and chlorine as the cold air hits your face as you step through the curtains. The bright lights seemingly made brighter as they bounce off the white ice. The smell of freshly-popped, salty popcorn. The sound of the skate blades as they cut through the ice as players step onto the surface. These are the tactile things that excite the senses as a hockey fan, and it's something I've been missing for a few months. It's hard to believe that the last hockey game I was lucky enough to call happened in mid-March. The last time I was in an arena to watch hockey was a week later. The last time I actually sat down and watched hockey on TV from drop of the puck until the final whistle was in the Stanley Cup Final in June. It's been a while without hockey, and it feels good to know we're literally minutes from the drop of the puck on the new season. As historic as the match-up is tonight between Toronto and Montreal, I'm not overly excited at the prospect of watching a retooled Maple Leafs team with perhaps their best lineup since Gilmour, Andreychuk, and Clark skated for them in the early 1990s beat up on a Montreal team that has been stripped of their best defender, their best goal-scorer, and their best prospect who were traded away in three separate trades. I could be wrong here, but I have a feeling that the Maple Leafs may win the first game of the season if they have all their guns firing. On the other hand, perhaps Carey Price, after all his injury woes over the last season, rediscovers the form that made him hockey's first $10 million goaltender. Perhaps Brendan Gallagher's 31-goal season last year wasn't just an aberration. Perhaps Paul Byron's annual 20-goal output continues. Maybe Max Domi, Jonathan Drouin, and Phillip Danault all have breakout seasons. And if all those things happen, maybe Montreal won't be as bad as everyone is predicting. Me included. In any case, hockey is back. It's been awhile, but it's back at the right time as the mercury in the thermometer gets close to the freezing point. If it's going to be a cold October, I don't mind tuning into the fastest game on ice. Let's just hope that the action on the ice heats up quickly!